Gnomeo & Juliet has arrived on DVD and Blu-ray, and I received my very own review copy! I still have no Blu-ray player though, so I can really only review the DVD version. The movies on both are the same, but the Blu-ray has more extras than the DVD, such as two alternate endings, deleted and alternate scenes, and "The Fawn of Darkness" which is described as Ozzy Osbourne's mumblings about voicing a little lawn deer, intercut with session outtakes. It's too bad, as I would have liked to see those extras. So this is film is an alternate telling of Shakespeare's Romeo and Juliet using garden gnome yard figurines instead of people, and of course having an alternate ending... it's not like they'd have two characters commit suicide in a children's film. I've never read Shakespeare's version, but I've seen enough re-tellings to recognize references to the original. So in this version, there is a duplex house on which one side lives an old lady named Montague and on the other side lives an old man named Capulet. The color scheme for Montague's side is blue while Capulet's side is red, and they both have a bunch of garden gnome figurines in their backyard. Now, the two old coots don't much care for each other, and this translates to their gnomes feuding with each other. At first it seems like a harmless rivalry, as we see the two sides get together for a lawnmower race. But when the red side cheats and causes the blue's mower to get totalled, the rivalry begins to escalate. An unintended consequence of this escalated feud is that the blue Gnomeo and the red Juliet both end up in disguises that hide their color, so that when they accidentally end up meeting on neutral ground they don't know they are rivals and become enamoured with each other. Then they fall in water and their disguise come off, and they have to come off, and they have to come to terms with these feelings. From here it's kind of the basic story of them sneaking out to be with each other, then both houses finding out and tragic consequences occurring. It's not really anything new in terms of plot, what's new is that it's done in a cutesy fashion with funny garden gnomes. In that sense, I thought it was just okay. I'm sure young kids would have really enjoyed it, but there didn't seem to be a whole lot of jokes for adults. I did really like Juliet's friend, the frog, as she made me laugh several times, but over all I didn't laugh too much. I think there were a lot of missed opportunities for humor. Usually in animated films I recognize only a couple of the voices, but in this one I recognized a whole lot, such as Ozzy Osbourne, Hulk Hogan, Richard Wilson (from Merlin), Julie Walters (from Harry Potter), Patrick Stewart, Jason Statham, and Michael Caine. 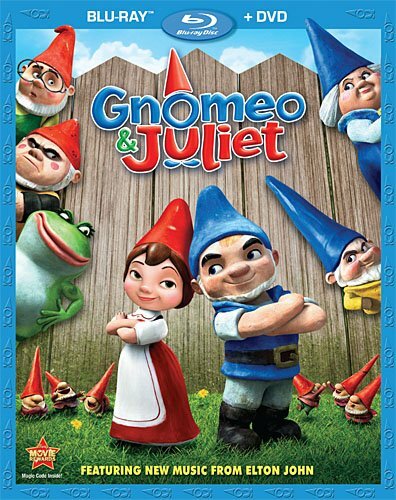 Surprisingly enough, I didn't recognize the two main characters, James McAvoy as Gnomeo and Emily Blunt as Juliet. The voicework was all well done; they voices all felt like they fit with the characters we were seeing on screen. The extras on the DVD include a short six minute featurette titled "Elton Builds A Garden", a two minute featurette called "Frog Talk With Ashley Jensen", and a minute and a half long music video called "Crocodile Rock". So not a whole lot. The Frog Talk is just Ashley Jensen talking about voicing her frog character, and the Elton Builds A Garden is about how the Gnomeo & Juliet came into being. Both were interesting enough, just very short. Anyway, you might want this DVD if you have kids, but if you don't then I'd say rent it first.